On the main floor of my house is a perfectly nice bathroom. It has white tile on the walls that is old but in good condition, and the slightly offset placing of the vintage black and white floor tiles has a quirky, unique look I really like. It was the first room I painted and made curtains for last winter after we moved in. It looks pretty and clean with minimal effort–a good quality in a bathroom. Unfortunately the bathroom upstairs does not share the charm of its main floor cousin, and of course it is the one we use primarily. The tile in this bathroom is a dirty-looking peach and the floor is an even dirtier-looking peach, with icky stained grout and a bathtub that appears to have stretchmarks I cannot scrub off. My husband is fond of some of the “historical” features of the bathroom, such as an old toothbrush holder that is recessed into the wall, hidden by a chrome panel, but then swings out into view when you push on it. The kids call it the toothbrush bat cave. I’ll grant that the toothbrush bat cave is kind of neat, and I generally have an appreciation for things that have withstood the test of time, but seriously I hate this bathroom. I’ve bleached and scrubbed and cleaned but it still looks dingy and gross. Plus…dirty peach. Ick. And did I mention that awful tub? Bleah. So I’ve basically ignored the existence of this bathroom long after our other rooms have been freshened with paint and shown some homemade love. My generally paint-averse husband actually scraped and painted the peeling ceiling himself a couple months ago, so I guess I now know exactly how long I can avoid doing something until he finally gives up and does it himself. I hated to put any effort into this room because I really just want to wait until we can afford to gut it and get a new, clean, nice one put in. But then I’d found this pretty fabric that kind of brightens up the dingy peach and I figured I might as well go ahead and paint the walls (white) and put up curtains so I can stare at them while I’m brushing my teeth instead of that nasty tile until our bathroom redo budget gets met. The Amy Butler Midwest Modern prints kind of hearken to a time when a home renovation might have included hiding something necessary but unattractive such as a toothbrush holder. I’d bought more of the fabric than I needed for the valance and I was thinking I’d make some strips to sew on the edges of towels, maybe make up a bathmat, decorative hand towels, stuff like that. But after I’d make the curtains and hung them in the much-despised bathroom I decided I actually liked the fabric too well to waste more of it on a bathroom I dislike. It’s unlikely I’d want to use the same fabric in the new bathroom when I’d have every pattern in the world to choose from (since I wouldn’t pick peach tile!) and I didn’t want to sew the fabric onto things I’d want to keep in the new space, like towels. So I switched gears and used the rest of the fabric to make a shirt for myself instead. Now I match my ugly bathroom, sort of, only I can leave so it’s different. I used New Look 6871 but did my own things with the sleeves. I had just enough left over to hem a strip just the right size for tying in my hair. Worth thought it was hilarious that I’d set the tripod up to take a photo of myself–I’m watching him laugh at me in the photo. I like the shirt and I think it was a much more satisfying project than the curtains. 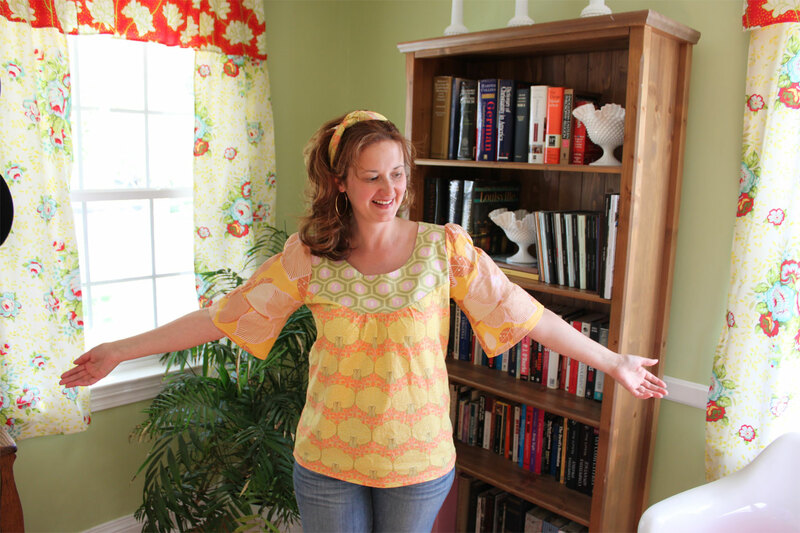 It’s a brighter, bolder print than I would typically choose for myself but it’s springy and fun. Sometimes I don’t like wearing shirts like this because they look homemade–you don’t generally walk into Target and see a similar item for sale. I tend to prefer patterns that draw less attention to their homemade-ness, but this one actually makes a good story. So far at least three people have asked if I made it and I told them all that I match my curtains. Thats so funny! The fabric made a very nice shirt! I once rented an old house in which the bathroom had dark forest green with salmon pink accent tiles. Ick! Why did they choose such gross colors back in the day!